Coral reefs are an amazing expression of nature. These living reef structures provide shelter, food and breeding grounds for numerous marine plants and animals. Coral reefs are the basis for a dynamic ecosystem with tremendous biodiversity. Most of Florida’s sport fish species, including spiny lobster, snapper, and grouper, spend significant parts of their lives around coral reefs. Florida is the only state in the continental United States with extensive shallow coral reef formations near its coasts. The Florida Reef Tract (FRT) stretches approximately 360 linear miles from Dry Tortugas National Park west of the Florida Keys to the St. Lucie Inlet in Martin County. Roughly two-thirds of the FRT lies within Biscayne National Park and the Florida Keys National Marine Sanctuary. 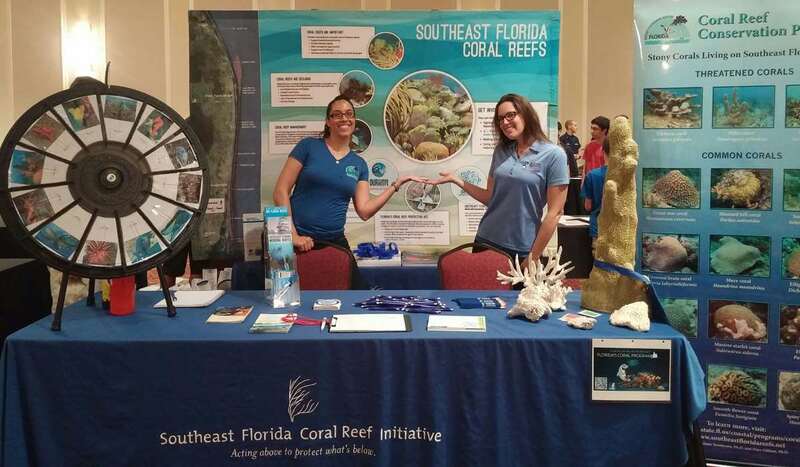 The reefs stretching north of Biscayne National Park and the marine sanctuary are managed by the Florida Department of Environmental Protection’s Coral Reef Conservation Program with insight from the Southeast Florida Coral Reef Initiative (SEFCRI). Close-up of the polyps of a Montastraea cavernosa coral with tentacles extended. Although corals may look like rocks or plants, they are actually animals, closely related to jellyfish and anemones! Corals are sessile, meaning that they attach themselves to the ocean floor. They are classified under the phylum Cnidaria and the class Anthozoa. A single “coral” is actually a colonial organism, meaning it is made up of hundreds to thousands of tiny polyps. Each soft-bodied polyp has a stomach with only one opening which is surrounded by tentacles. A polyp both takes in food and expels waste through its “mouth”. The tentacles are used in defense, to pull food into the mouth, and to clear away debris. 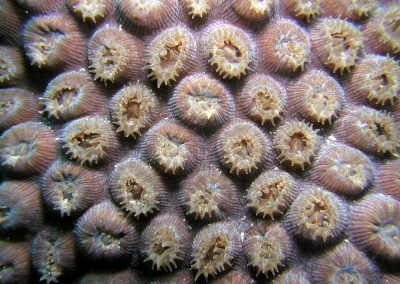 All polyps on one coral colony are connected to one another by a thin band of living tissue, called the coenosarc. Coral communities can be found in shallow or deep waters. However, coral reef development occurs only in areas with specific environmental characteristics: a solid structure for attachment, relatively high water temperatures, clear waters low in phosphate and nitrogen nutrients, and moderate wave action to disperse waste and bring oxygen and plankton to the reef. Other factors that influence where corals can live are the salinity of the water, the amount of sunlight that penetrates the water, and the presence of species that help control macroalgae, like urchins and herbivorous fish. Florida’s offshore waters have these characteristics and support shallow water reefs. Corals get their nutrients from multiple sources. They feed on tiny particles in the water column by extending their tentacles, which are armed with stinging cells called nematocysts, into the surrounding water to catch prey, and they obtain nutrients from microscopic algae that live inside their tissues in a unique partnership called symbiosis. Symbiosis means that each partner receives a benefit from the partnership. Corals obtain energy, nutrients, and oxygen from these algae, called zooxanthellae, and the zooxanthellae receive nutrients and protection from the corals. The zooxanthellae also give the corals their beautiful spectrum of colors. Bleaching is a stress response that results when the coral-algae symbiosis breaks down. The corals lose their algae, causing them to turn pale or completely white, known as “bleaching”. 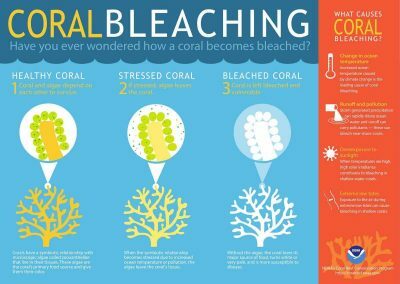 Coral bleaching can be caused by a wide range of environmental stressors such as pollution, oil spills, increased sedimentation, extremes in sea temperatures and salinity, low oxygen, disease and predation. Bleached corals are still living, and if the environmental conditions return to normal soon enough, the corals can regain or regrow their zooxanthellae and survive the bleaching event. If the stressors are severe or prolonged, however, bleaching can lead to the death of corals. Bleached corals are more susceptible to disease, predation and death because they are without their primary energy source. Localized or colony-specific bleaching has been recorded for over 100 years but only in the last 20 years have we seen mass bleaching events in which a wide range of coral species bleach over a large area of reef. Also, there is an indication that coral bleaching has increased in frequency and severity along the Florida Reef Tract since the 1980s. While the influence of local stressors can explain small-scale bleaching events, widespread, mass bleaching is most commonly attributed to elevated sea temperatures in conjunction with increased ultraviolet radiation due to calm weather and clear skies. Because most corals live close to their maximum thermal limits, a temperature increase of only 1 to 2 degrees Celsius above the long-term average can trigger mass bleaching, particularly when prolonged. In situations where bleaching causes extensive coral death, recovery is dependent on new coral recruits settling and growing on the reef. This is a time-consuming process, even on relatively healthy reefs. Regrowth of reefs that have been severely damaged by bleaching may take decades, and the new reef may be significantly different from that which existed before bleaching. If a recovering reef is affected by another bleaching event or stress before it has fully recovered, then it may persist in a degraded state for much longer. In locations suffering from pollution or other chronic pressures, recovery can be particularly slow or inhibited altogether. Reef growth is extremely slow; an individual colony may grow only ½ inch to 7 inches (1 cm to 18 cm) a year, depending on the species. Stony corals are the major reef architects. Individual polyps on stony coral colonies extract calcium from seawater and combine it with carbon dioxide to construct the elaborate calcium carbonate skeletons that form the reef backbone. As this process is repeated over many years, stony corals can create massive reef structures that provide habitats for many important species, including most of Florida’s sport fish species, particularly during their younger development stages. Corals can reproduce asexually through budding or fragmentation, and sexually via broadcast spawning or brooding. 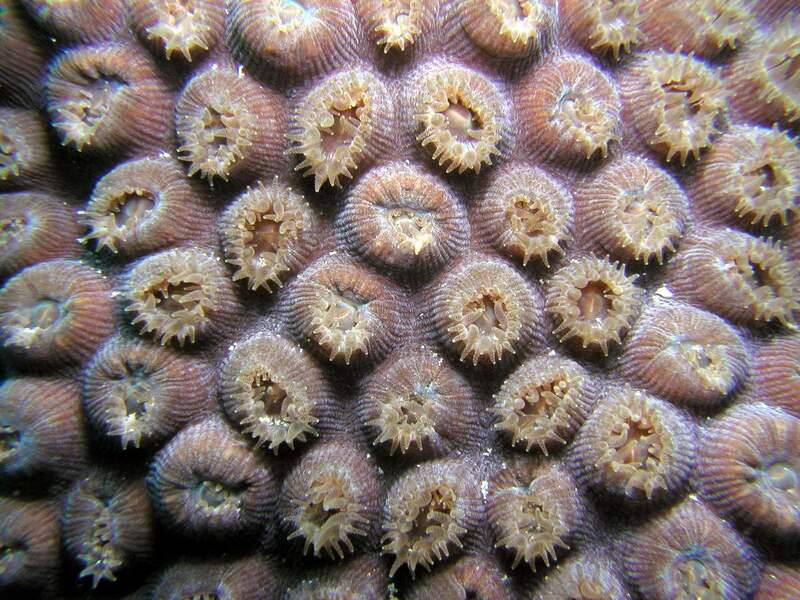 Budding occurs when new polyps form from a dividing parent polyp, causing a coral colony to grow in size. This process produces polyps that are genetically identical to the parent polyp. Fragmentation occurs when a portion of a larger colony is broken off from the main colony, creating a new colony that is genetically identical to the original colony. This can happen from storm activity, boat anchorings or groundings, or from people damaging the reef. The new fragment will only settle and grow, however, if it is exposed to favorable growth conditions. Broadcast Spawning occurs as a synchronized event, when corals release large quantities of eggs and sperm at about the same time in response to cues from the environment including temperature and lunar cues. Because corals are sessile and cannot move, timing is very important. The egg and sperm join to form free-floating larvae called planulae that are transported by water currents until they land on suitable substrate to settle and grow. This type of sexual reproduction contributes to offspring that are spread over a wide geographical area. Brooding species release larvae that were internally fertilized, which then settle and grow into new colonies. Larvae from brooding coral species tend to settle more quickly and within a smaller geographical range than larvae from spawning species. What types of reefs are found in Florida? The three major types of coral reefs around the world are atolls, fringing reefs and barrier reefs. Fringing reefs form borders along shorelines and grow seaward from the shore. Barrier reefs form parallel to shore but are separated from it by a lagoon. Atolls are reefs that continued to grow upward after the island they surround has sunk. Other types of reef are bank reefs, which have no obvious link to a coastline, and patch reefs, which are small, isolated reefs that grow between the reef tract and land. Florida’s coral reef system most closely resembles a barrier reef; however, the reefs are closer to shore and they lack the shallow inshore lagoons found on most barrier reefs. For this reason, the Florida Reef Tract is more aptly referred to as a bank reef. Florida also has patch reefs, which grow in shallower water in between the reef tract and land. Patch reefs are typically small (the size of a backyard or a small home). Generally, the reefs in southeast Florida occur in three parallel lines extending north from Miami-Dade County, changing to more isolated patch reefs in Martin County. Different reef organisms characterize the type of habitats found along southeast Florida’s reefs, typically transitioning from a cover of algae and small octocorals nearshore to numerous octocorals and varied stony coral populations at the outer reefs. The various reef architectural and compositional components create an environment that is ecologically diverse and productive: one that supports all of the other aquatic plants and animals that make southeast Florida reefs their home. Corals take on many shapes, but can generally be divided into two main categories: stony corals, also known as scleractinian corals, and octocorals (sea fans, sea whips and other soft corals). More than 45 species of stony corals and 35 species of octocorals are found along the Florida Reef Tract. Marine sponges are also very important within the coral reef community, and more than 70 species can be found along the Florida Reef Tract. Historically, Florida’s reef-building corals were brain, star and elkhorn; all are not as common now as they once were. Brain coral is dome-shaped and has the waves, folds and ridges that resemble those of a human brain. Star coral is also dome-shaped, but has a distinctive star pattern on its surface that is caused by the accordion-like folds within its polyp cups. Elkhorn and a similar coral called staghorn are so named because their branchlike projections resemble the antlers of those animals. In recent years, corals have experienced declines due to a combination of factors including coral disease, coral bleaching, high ocean temperatures and human impacts. Waves from storms and hurricanes can break coral colonies or cover them with sediment, algae can overgrow broken corals before they get a chance to recovery, increased sea surface temperatures can lead to wide-scale bleaching events, and when ecosystems are thrown off-balance, coral can be vulnerable to extreme predation by fish, sea stars, and other invertebrates. Coral reefs are also harmed by anything that affects water quality such as pollution from land-runoff or fuel spills. Coral reefs may recover after exposure to periodic damage, however, if corals experience sustained stress, including those imposed by people, they will have no recovery period and reefs will not be able to bounce back from even small declines. Many individuals, agencies and organizations have taken proactive steps to try to improve the status of reefs. These efforts can come in the form of government regulations and services, industry standards of best management practices, improved science and management, changes in user actions and awareness and increased community involvement. Below are a few examples of each. Feel free to join in or create your own efforts to help protect these valuable resources. In 1990, the State of Florida banned the collection of hard corals, octocorals and other associated organisms in an effort to increase protection of these critical components of the reef. 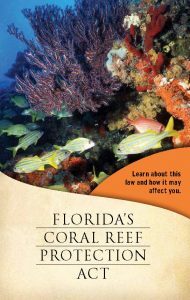 Then in 2009, the State of Florida enacted the Florida Coral Reef Protection Act (CRPA) to increase protection of coral reef resources off the coasts of Martin, Palm Beach, Broward, Miami-Dade, and Monroe counties. The CRPA provides Florida with the ability to recover monetary damages to provide additional disincentive for damaging coral reefs. In addition, size and catch limits of fish and lobster are managed by law to reduce over fishing. Increasingly, mooring buoys are being installed as a way of protecting bottom resources from anchor damage. Commercial and recreational divers and fishers should use mooring buoys whenever possible. When moorings are not available, boaters should anchor in sandy bottom areas, not on coral reef habitats. Increased presence of pump-out facilities for marine toilets provides for improved water quality. Recycling promotes environmentally sound ways of disposing of motor oils, as well as consumer waste products like plastic bags, cans and aluminum. The State of Florida and the state’s counties have also offered many different benefits to citizens who use environmentally-friendly household appliances, such as toilets and shower heads. Be sure to check with your local county to see what benefits they may offer you for replacing your older models with new, environmentally-friendly models. As we gain greater understanding of our coral reef systems through increased science and application of information, we are better able to manage our resources for better use by all. New information on the benefits of herbivorous fishes and invertebrates on reefs has led to re-stocking efforts of key species like the long-spined sea urchin. Coral spawning studies are helping us better understand coral recruitment and restoration of damaged areas. Many citizen groups and educational institutions are engaged in active research targeted to learn more about current reef conditions and increase our understanding of impacts to reefs. Some of the most beneficial research involves coral mapping, which allows scientists to better understand and monitor the distribution of this invaluable resource. The United States, together with international partners, designated 1997 as the International Year of the Coral Reef as part of a larger effort to highlight reef conservation and 10 years later, 2008 was designated as the new Year of the Coral Reef to maintain interest and build on the work that had already been started. 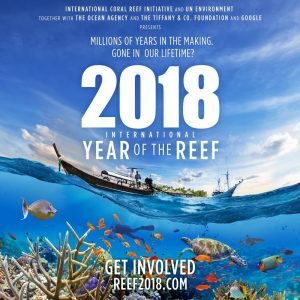 Now, the International Coral Reef Initiative has once again designated 2018 and the International Year of the Reef, focusing on increasing awareness of the global value and importance of coral reefs. These highlights provide ways of reaching out to the general public and increasing their understanding of how delicate and important coral reefs are. Additionally, the Florida Department of Environmental Protection’s Office of Coastal and Aquatic Managed Areas has designated May as Florida Reef Month. Check this and other sites for events, activities and cleanups near you. 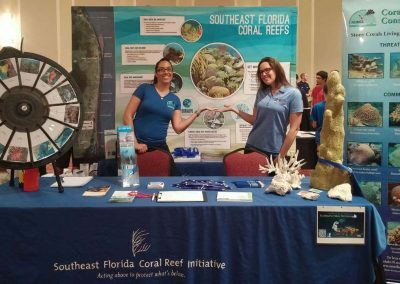 Many opportunities are available for members of the public to become actively involved in helping to better understand and protect coral reef systems. Beach and underwater clean-ups, volunteer fish and coral surveys, sea turtle nesting watches, and other opportunities provide great ways to learn more about the marine environment as well as provide valuable services and information to help protect it. Taking part in scoping meetings and even expressing your opinion to your representatives is important in shaping the direction and funding allocated to protecting coral reefs. SEFCRI is an important part of improving the condition of local reefs. By bringing together a diverse group of stakeholders to guide activities, everyone gets to become a partner in coral reef conservation and help advance actions that have positive impacts for reefs.